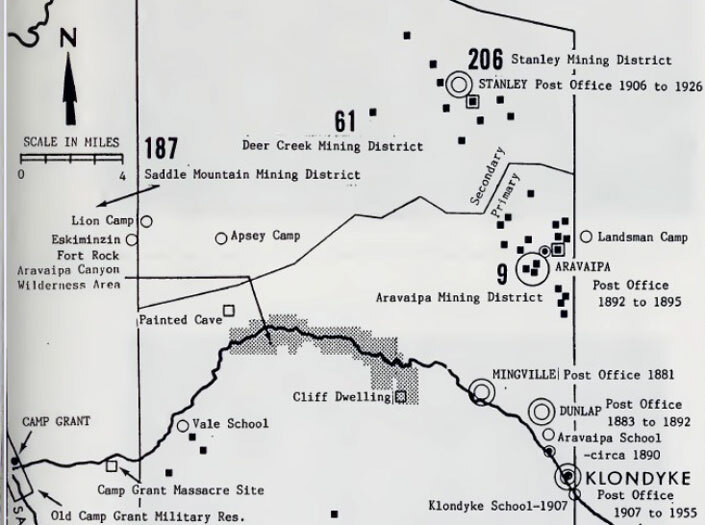 Mining activity in the old Aravaipa District was not confined to the immediate area of the Aravaipa townsite. 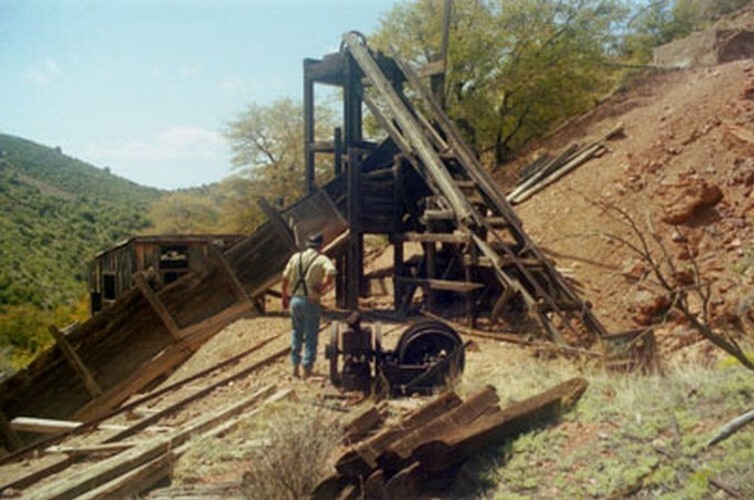 Several of the more productive mines were located a few miles away. This map from the BLM publication named below shows the general layout of the district. 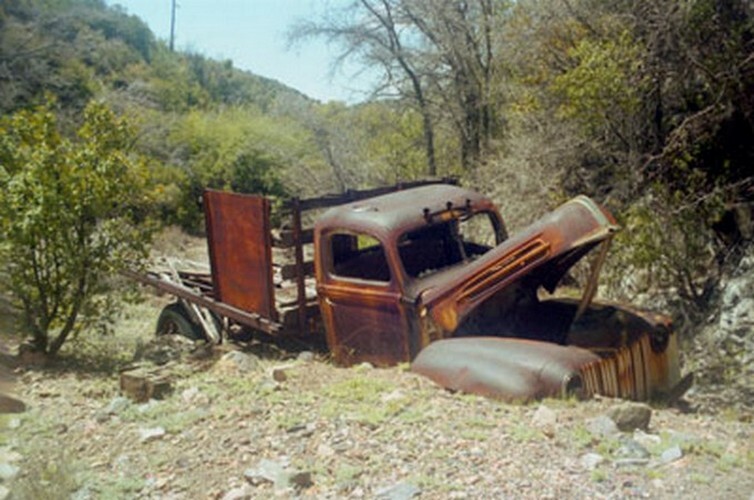 In the mid-1990's, we had been able to drive close to several of the old mines. It is now a walk of nearly 2 miles to get to the sites. In the later years of the district, mini-camps were established away from the town site. Twenty years ago, this old building was still standing. 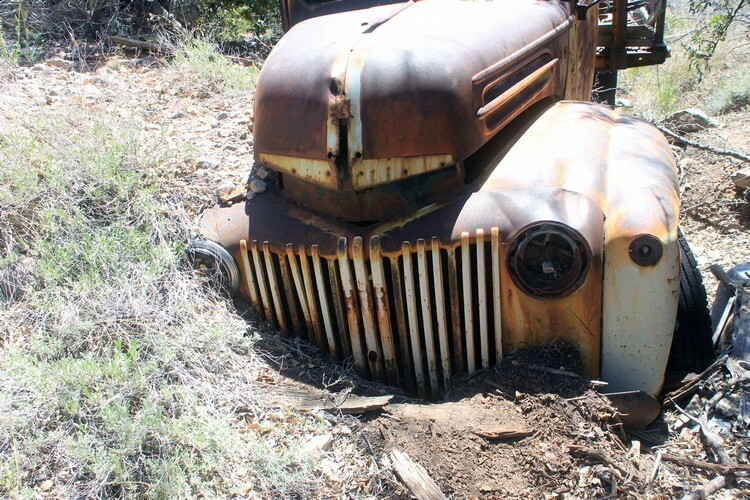 An early to mid 1940's Ford pickup still sits along the old road. It does not seem to have aged much since we last passed by. On that visit, the hood was propped up so that an inspection of the 6 cylinder flat head engine could be more easily accomplished. This old portable air compressor still waits to the side. A comparison to its photo from nearly 20 years ago, shows very little change in its appearance. From 1950 to 1957, this mine was the one of the more important producers in the district. The mine workings included a 210' adit and an inclined shaft with several levels. Ore minerals contained Lead, Zinc, Copper and Silver. The ores were trucked to Klondyke to be run through a concentrator. The concentrates were then shipped to smelters in El Paso and Arkansas. 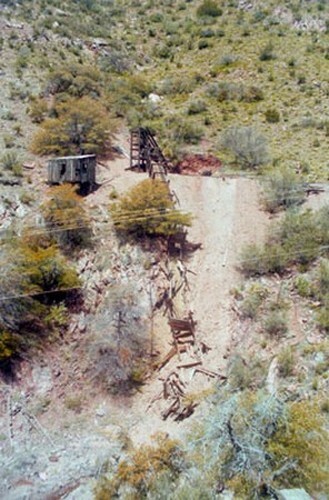 This mine was re-opened briefly in the 1970s. A Westinghouse electric motor provided the power to run the hoisting equipment. That power was directed through a transmission and then on to the hoist. This was the view that the hoist operator had of his machine. In the lower right was a resistor grid that would have functioned as a speed control for an electric motor. I did not notice a manufacturer of the hoist equipment. Directly across the canyon, was another lead producing operation. This mine was in production before 1925, but its most productive years were between 1948 and 1953 . Over that span of time, the yearly average rate of production was approximately 1400 tons of ore. From 1950 to 1952, the lead ore averaged 17% lead. In 1958, a Colorado company was at work extending the workings of the mine. There is no record of any production from that time period or from any time period later. The collapse of the small hoist house has left the equpment exposed to the elements. 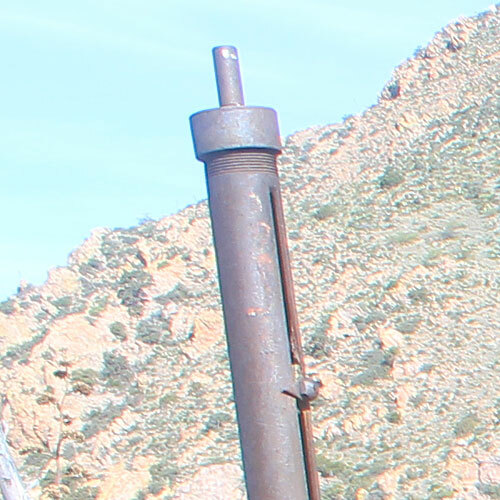 In this view of the head frame, it can be seen that the head pulley is gone. This mine hoist was manufactured by the Browning Manufacturing Company in Maysville, Kentucky. 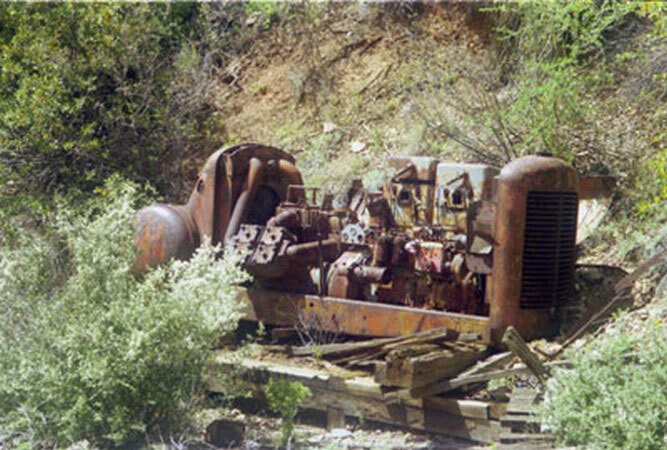 Tucked away in the brush, was another old hoist. 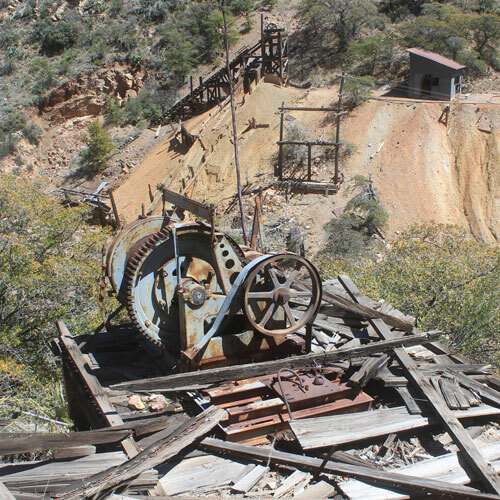 Another old mining operation is perched high on a steep hillside. Its obvious feature is the 1000' long inclined railway that was used to lower ore cars to a bin at the bottom of the hill. Production from this mine is reported from the years 1926 to 1928. An incredible 3,500,000 pounds of lead, 1,214,797 pounds of zinc and $20,000 worth of silver were supposed to have been produced. 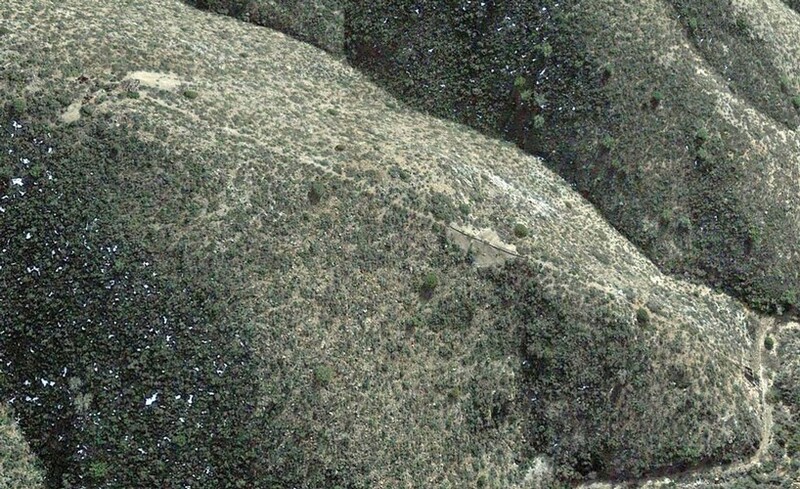 There is no real evidence at the site that this mine had that kind of production. This mine was renovated and put back into operation in the 1940s and 1950s. In 1951, production was supposed to have reached 30 tons per day. 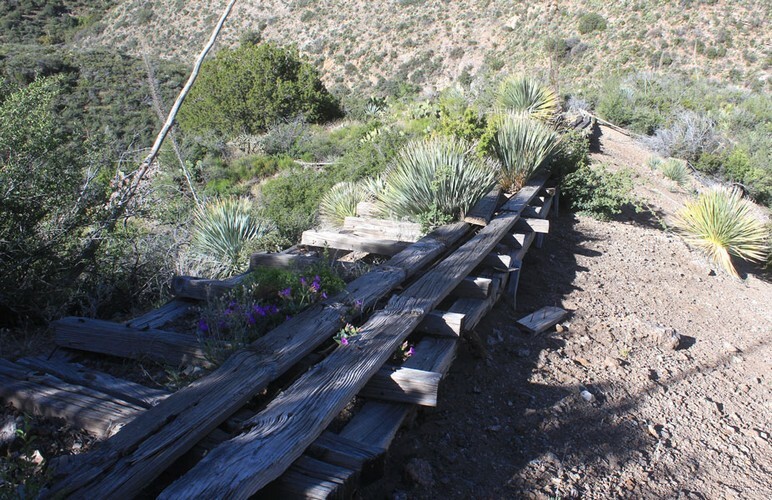 The railroad rails have been removed from the incline. The supporting cross ties are still in place. Approximately half way down the slope, a low trestle was constructed across a gully that had been filled with waste rock. The rails were probably mounted in the space to the left on the trestle. The 2" boards may have served as a guide for the winch cable. This was the bin that collected the ore materials brought down the incline. The ore cars were raised and lowered by the large hoisting machine on the left. Materials were moved in and out of the inclined shaft with the smaller winch on the right. The large winch may have been manufactured by Link Belt. The smaller one was from "West Coast". The top photo on this page is a close-up view of the smaller machine. The heavy cable that moved the cars on the railway still extends to the left from the large winch. I think that the nearly vertical shaft to the left was an indicator that let the hoist operator know how far his cable was extended down the railway. 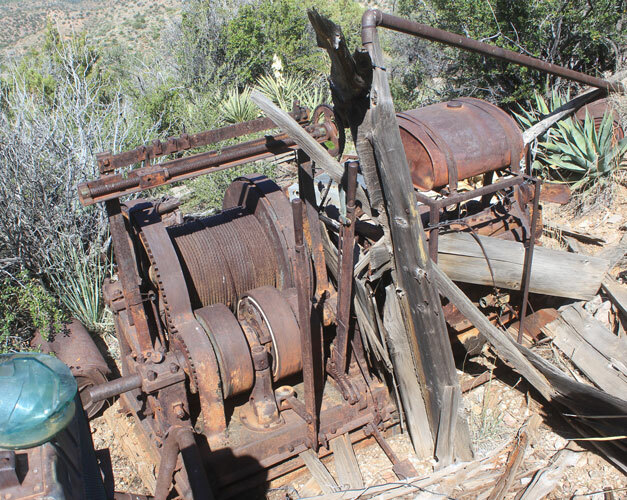 The winches were powered by gasoline engines. 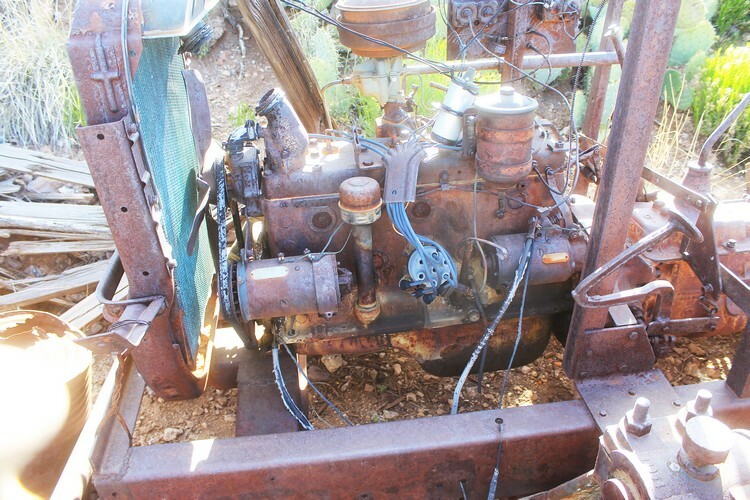 This six cylinder flathead Chrysler engine ran the larger winch. Its output was directed through an automotive type transmission. The clutch pedal had been rigged so that it could be hand operated. 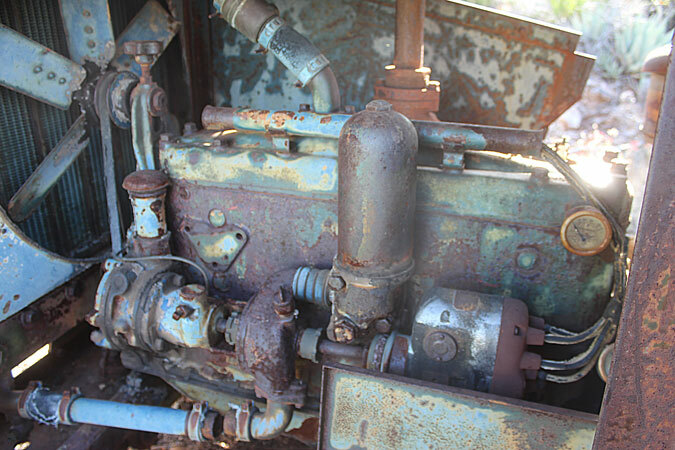 This engine is newer than the the 1920's era of production credited to the mine. The smaller West Coast winch had been powered by this 4 cylinder flathead engine. I had to ask for help at Smokstak.com to identify the engine. It was suggested that this was an early Buda engine. The headframe is now just a stack of lumber. It would have been interesting to have seen it still standing to be able to understand how the ore was transferred from the mine to the railway. 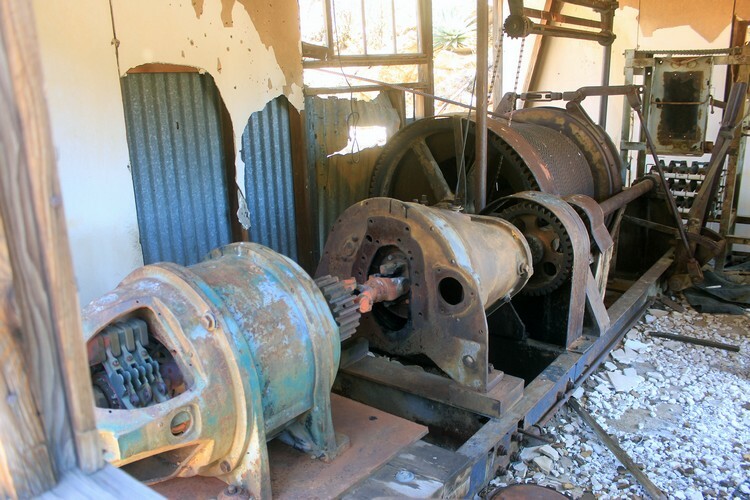 The head pulley now lies among the broken pieces of the headframe. This was the opening to the old mine. Men went up and down the incline on ladders that were to the left. Mined materials rode the rails to the right. This Worthington compressor supplied the compressed air for the mine's operation. It was necessary to hand crank the engine in this machine. This is all that remains of an old building at the site. I did not have the chance to really look around to see if I could figure out how it had been used. I used two references for information on this area. The primary source was a publication from the BLM. 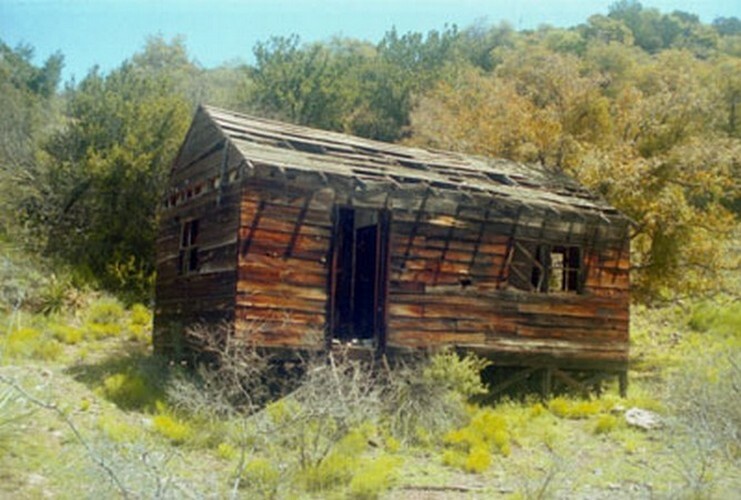 Its title is: "Environmental Change In Aravaipa 1870-1970." Particulary interesting and useful was the chapter on mining. I was able to download a PDF version of the document here. The other source of information was "Geology of the Klondyke Quadrangle". That can be found here.